Supported by Suzhou Government, MDS joins forces with major partners in various medical sectors and together stage the first Global Device Week in Suzhou from 6-9 September 2018 – 15.000 visitors and top delegates are expected to shape the future of medical industry. Modern medicine is developing towards early detection, precise quantitative diagnosis, non-invasive treatment, individualized diagnosis and treatment, intelligent service along with other directions. Family and individual health status and recuperation, disease detection, health management, rehabilitation and heath care have helped to push the pace of China’s medical device innovation. 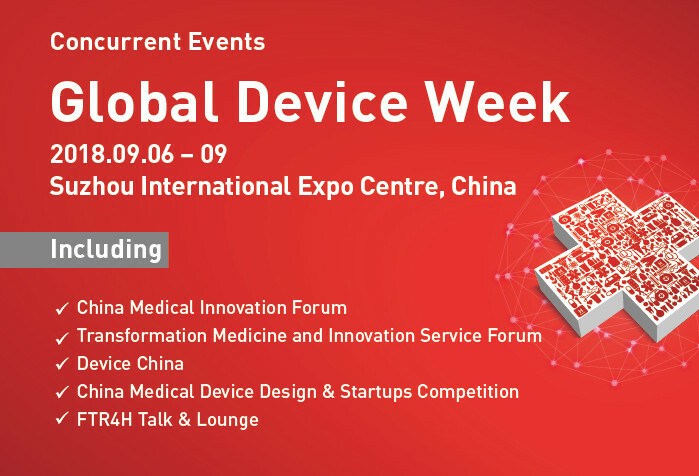 To respond to this trend, support international innovation, collaboration and speed up commercialization of medical device clinical research and institutes’ achievements, Medical Fair China - together with its prestigious partners - will launch the Global Device Week from September 6 to 9, 2018 in Suzhou International Expo Center. Five high caliber events staged at the same time and place will include China Medical Innovation Forum (CMIF), China Medical Device Design & Startup Competitions (CMDDSC), Device China, Transformation Medicine and Innovation Service Forum (TM&IS) , FTR4H Talk & Lounge and over 10 sub forums, expecting to cover up to 20,000 square meters and gather national academic speakers, overseas guests, innovative roadshows of high-profile innovation projects from China and abroad. In attendance will be over 400 local and international innovative medical device R&D institutions and manufacturers, renowned innovation service providers. 5,000 forum participants are expected amongst which are investors, presidents and clinicians, universities and research institutes as well as global dealers and market leaders from across the globe, together with the visitors of Medical Fair China, in total over 15,000 industry peers are estimated. Suzhou Municipal Government also makes great efforts to support and promote the events. Last year, CMIF attracted 1,268 visitors with +80% are medical device retailers / agents, investors in the medical device sector, clinical specialists / physicians, product desigers, R&D, registration institutions and medical device manufacturers. This year’s visitor number is likely to set a new record. Topics will include the changes and interpretation of Chinese policies on medical device innovation, development trend of China’s medical device innovation and market, application of 3D additive manufacturing technology in innovative medical device R&D and production, application of big data and artificial intelligence (AI) in disease diagnosis, crossover assembly of AI + Medicare masters, all not to be missed. To learn more about the themes and keynote speakers, please visit Medical Fair China official website: www.medicalfair.cn .